It doesn't come as a huge surprise considering the Galaxy Tab S5e was announced alongside the Galaxy S10, but a new leak suggests that Samsung is readying itself to unveil the Galaxy Tab S5. Based on details found within the firmware of the upcoming Samsung Galaxy Fold, it looks as though the company has plans to unveil a Galaxy Tab S5 in the future. The details were discovered by XDA Developers, and include specific mention of the Qualcomm Snapdragon 855 chipset too. That's the latest generation chipset from Qualcomm, and it features inside the Galaxy S10 and Galaxy S10 Plus if you buy those phones in the US. It also features in a variety of other top-end handsets that you can buy in 2019. That's especially interesting as the company's last flagship tablet - the Galaxy Tab S4 - didn't feature the latest generation chipset at the time, instead opting for the Snapdragon 835 over the Snapdragon 845. The code suggests the Galaxy Tab S5 is set to be a different product to the already-launched Galaxy Tab S5e. That's a mid-range tablet, while it's expected the Tab S5 will be a flagship device. This has all come quite quickly considering the Galaxy Tab S4 was only unveiled in August last year, a week or so before the introduction of the Galaxy Note 9. That suggests to us it may still be a bit of a wait until we see the Galaxy Tab S5 hit the market. It would especially be strange for Samsung to announce the slate when most of the attention is on the Galaxy Fold, which is a folding phone that can turn into a 7.3-inch tablet. 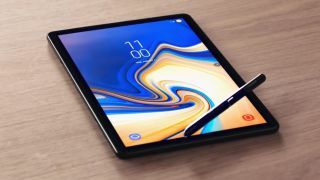 Although we don't have any hard and fast details about the Galaxy Tab S5 release date at the moment, our current best guess is that we'll see it introduced ahead of the Galaxy Note 10 toward the end of this year.